Signum University sprouted from a desire to take fantasy and science fiction literature seriously. Building from the success of his Tolkien Professor podcast, Signum’s Founder and President Dr. Corey Olsen wanted to foster a serious academic discussion on imaginative literature among scholars and fans alike. Over the last seven years, many volunteers and donors have contributed toward the success of that vision. Signum Graduate School: A pioneer in online education, Signum offers a Master of Arts in Language & Literature that allows students to focus their degree work in one of four areas: Tolkien Studies, Imaginative Literature, Germanic Philology or Classical, Medieval & Renaissance Literature. Mythgard Institute: A center for research and education in speculative fiction, Mythgard provides educational opportunities to the public through programs such as Mythgard Academy, the Mythgard Movie Club, the Silmarillion Film Project, and Lord of the Rings Online activities. Signum for Kids: Launched in Summer 2017 with the popular Hobbit Immersion Camp, Signum’s kids programming is a way that we are bringing fun and educational study of imaginative literature to children. These programs have seen great success in just a few short years – and Signum University wants to do even more! Started from scratch as a 21st century university, Signum is ready to continue building these programs that use the digital connections of our world in a fulfilling and edifying way for all who want to learn what they love. 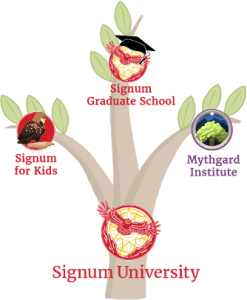 During our campaign, we will highlight the excellent programs and activities that the various branches of Signum conduct on a regular basis. Every other Friday at 10 a.m. – Silmarillion Film Project – Season 4 starts Oct. 12th! In addition, we will have a few special events that have become staples of our annual campaign, including a closing webathon. See the list of events happening during our campaign period. Links to more information will be provided as more details become available. For those who can’t make it live, all events will be recorded and available for free viewing on the Signum University YouTube Channel. Note: All times are Eastern Daylight Time. Signum University’s students, staff, and faculty are grateful to our donors, and we want to show our appreciation. As a result, individuals who donate at certain levels will receive certain benefits as outlined in the table below. Note: This year we are making it even easier to receive benefits through monthly donations. Recurring monthly donations help Signum better plan for budgeted expenses throughout the year. Please consider setting up a recurring contribution when completing the donation form. If you enjoy the activities offered by Signum University and the Mythgard Institute, please donate today. Donating not only gives you the special access to programs and courses noted, but it lets you help others enjoy our free educational materials as well. Send your questions about donor perks and other donation-related inquiries to donate@signumu.org.